From Africa To Atlanta By Way of Arkansas is on loan to the H..J.C. Bowden Multi-Purpose Senior Center in East Point, Georgia. It is part of a fall exhibit of quilts sponsored by the Clara Ford Foundation. 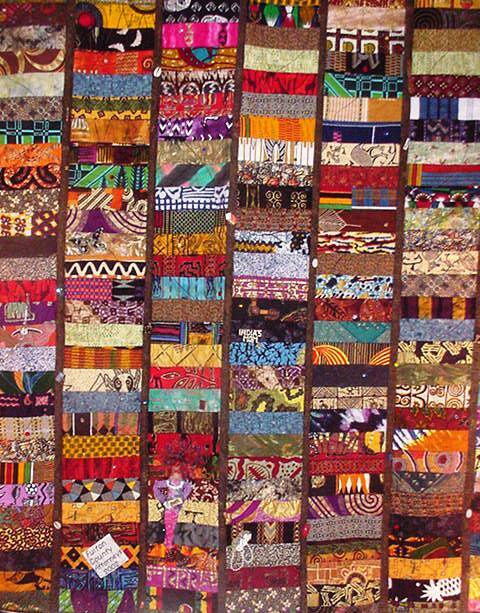 From Africa To Atlanta By Way of Arkansas is my personal memory quilt. It exhibits many memories from my life and is #1 of a series of 100 memory quilts in my African Canvas Memory Quilt series. This entry was posted in A Quilter's Life, Places to See My Quilts and tagged African American quilter, African Canvas Memory Quilt, H.J.C. Bowden Senior Multipurpose Center, O.V. Brantley, wallhanging. Bookmark the permalink.